Ikeni is a third six pupil (3 years PQE) at 3PB with an emphasis on Personal Injury. He regularly appears in Fast Track trials and Small Claims, as well as other hearings including stage 3s, credit hire, and interim applications. He takes instruction in the full range of paperwork, including advices on quantum. He is available to act in possession hearings, regulatory hearings, and winding-up and bankruptcy applications. He is client-friendly and always willing to discuss issues of law, strategy, or procedure. Prior to coming to 3PB, Ikeni gained extensive experience in RTA and credit hire cases. He also gained advocacy experience in the Crown and Magistrates Courts and assisted in a range of high-profile cases involving chancery, public, commercial, EU, competition, and sports law. The latter included advising and drafting for matters in the Court of Justice of the European Union, Court of Appeal, High Court, and Employment Tribunal. 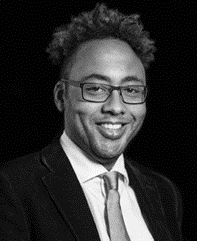 Before pupillage, Ikeni completed an internship at a Tier 1 (Chambers and Partners) commercial firm in Southern Africa. He acted as research assistant in EU law at the University of Oxford and organised two conferences for the International Journal of Constitutional Law. He worked on human rights projects including: visiting East Timor to assess the progress of the truth and reconciliation process and Special Court; conducting preliminary research for the Human Dignity Trust; and assisting in drafting standard operating procedures for the police in Sierra Leone. He also has policy, parliamentary, and IT experience. Winters v Williams: successfully established a claim for personal injury arising from an RTA before a circuit judge in a Fast Track claim. Deeprose-Peck v East Kent Road Car Company Ltd: successfully established a Fast Track claim for personal injury in relation to an RTA. Negotiated quantum. Fuller v Poundworld Retail Ltd: successfully established a claim for personal injury sustained by C while undertaking manual handling at work in a Fast Track trial. B&M Pallets Ltd v EUI Ltd: successfully resisted recovery of rental charges for commercial premises in an RTA. Neill and ors v TUI Ltd: successfully applied for pre-action disclosure in a holiday sickness claim. FCA v Fagbulu: acted for the debtor in a bankruptcy petition brought by the Financial Conduct Authority. Pre-action advice: in a fatal injury claim which occurred in Costa Rica on a snorkelling trip including advice on jurisdiction and the Package Travel, Package Tours, and Package Holiday Regulations 1992, (assisted). Pre-action advice: on the proposed sale of goodwill in an investment management practice, (assisted). English Bridge Union and anr v Sport England: advised on challenging a decision by Sport England that bridge does not constitute a sport for funding purposes, (assisted). Pre-action advice: on breach of a commercial contract for the installation of an air conditioning system in Dubai, (assisted). Bird v Newstart Services Ltd: D was induced to enter negotiation prior to the hearing following service of the skeleton argument I had drafted. Negotiated settlement on behalf of the claimant in employer’s liability claim. Kokoruwe v Hirani and Admiral Insurance Company Ltd: represented the insurer in negotiating and resisting the claim for credit hire charges. R v Delaney: successfully negotiated for assault charges to be dropped on an agreed basis. Other: often drafts advices on quantum for infant settlement approvals. O’Brien v Goldsmith and anr: drafted skeleton argument to strike out particulars of claim in a partnership dispute in the Chancery Division, (assisted). Joe & Co (Hair) Limited v Gavin Cornwell and anr: drafted particulars for breach of equitable and contractual duties of confidentiality, and breach of the Copyright and Rights in Database Regulations, (assisted). Leeds United Football Club v Bates: drafted a defence and counterclaim in a claim for breaches of contract and fiduciary duty, (assisted). Updated EU competition law elements in the chapter on Financial Regulation in Sport, (assisted Adam Lewis QC). Assisted in editing the chapter on the institutions of the EU, (assisted Prof Pavlos Eleftheriadis (ed.)). In his spare time, Ikeni plays canoe polo at a local canoe club. He is also an avid swimmer and enjoys kayaking more generally. Free Representation Unit: ‘experienced representative’. Oxfam’s Lawyers Against Poverty: developed a pro bono scheme for law firms to support refugees and asylum-seekers. French: basic comprehension and spoken.